Congrats to these 3 KNOXX youth athletes, Louis Benitez, Leo Silva and Dania Silva that won Gold in both “Gi and No Gi” competitions at Naga 2017 (North American Grappling Association) this past weekend. KNOXX have watched Jason Chih improve his game year after year for the past few years now. @iamjasonchih is also the first youth athlete to be on the KNOXX Youth Jiu Jitsu Competition Team years ago. We have seen much hard work and dedication from him and we are extremely proud of him as a Pan Kids Champion for 2017. Pan-American Championship, is the largest Brazilian Jiu-Jitsu tournament held in North America. Keep up the great work, have lots of fun, and keep inspiring! Congrats to Jason and Ashley Chih @iamjasonchih for both taking Double Gold at “The Good Fight” Jiu Jitsu Tournament today! Great job by both of them! Proud of Ashley going up against the bigger boys and still taking double Gold in her second jiu jitsu competition! Youth Jiu Jitsu Rash Guards now available. Youth Jiu Jitsu Rash Guards are restocked and available at www.KnoxxGear.com. Now available in 3 colorways. I always ask parents what they are bringing their kids to Jiu Jitsu for. Its a weird question. When you sign your kid up for soccer, nobody asks why you “really” signed him up. You hope he or she learns the game and has fun. But martial arts has long been viewed (and rightfully so) as a way to help its practitioners become the best version of themselves. So before a kid ever steps on my mats, I want to know why. There is no wrong answer. Fun, discipline, fitness, all these buzz words come up all the time and martial arts teachers are happy to use them in their sales pitch. But confidence, how in the world do you teach confidence? The short answer is you can’t. Confidence is something that comes from inside a person, no one can gift you confidence. To me, confidence is knowing that I have what it takes to not only survive a challenge but overcome it. The challenge always changes, but the skill of self reliance doesn’t. 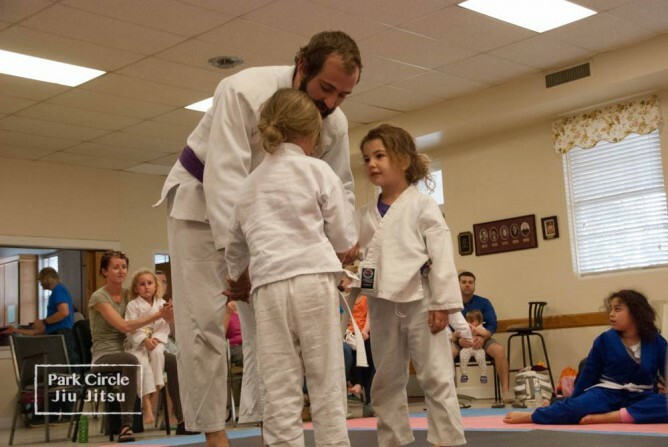 So if you can’t teach confidence, how do kids obtain it from the martial arts? Its a simple process but a long one. Children gain confidence in two ways: by completing challenging tasks and by the belief from others that they are capable. Challenge and confidence. We all need this to grow. You need a mountain and you need a sherpa. I think many parents are very afraid to see their kid be sad or disappointed so they try to make smaller or no mountains. This doesn’t build confidence. I believe this builds anxiety. We have to encourage our children to pursue the big things that they are drawn to. Maybe skateboarding is scary to me, but to your son that is the most scary and exciting thing he can think of. In Jiu Jitsu, we are challenged every day we step on the mats. Some days, even I feel a mild form of anxiety driving to my own training. Not because I think anyone will hurt me, but because I know I am about to be challenged and I am afraid of not having enough. The fear of falling short is real. But I go anyway, because I know that in order to be better, I have to learn to eat challenge like a chewable vitamin. This most exciting thing for me is to see a kid slowly let go of their fear and replace it with grit. The ability to be ok even in seemingly impossible levels of challenge. If all I do is pass that on to one kid, I will have done my job. As one great Jiu Jitsu teacher says “you can’t teach heart”.